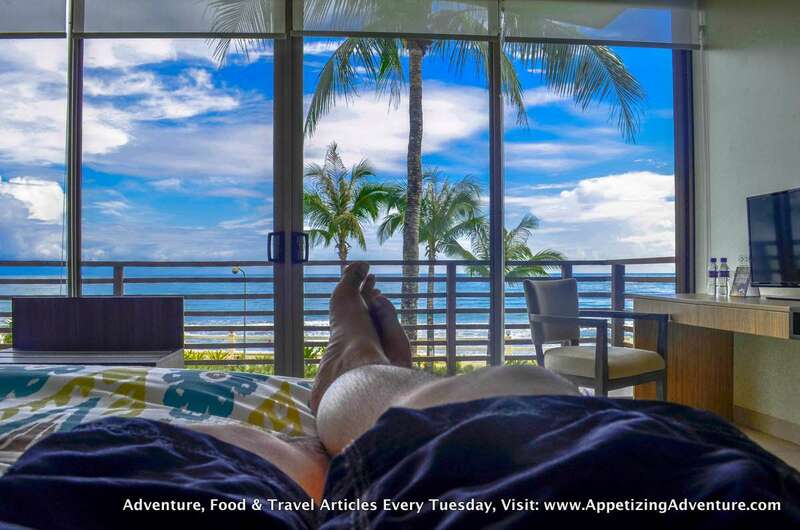 Choosing where to stay in every destination during vacation or a quick getaway matters a great deal to contribute to the overall experience. 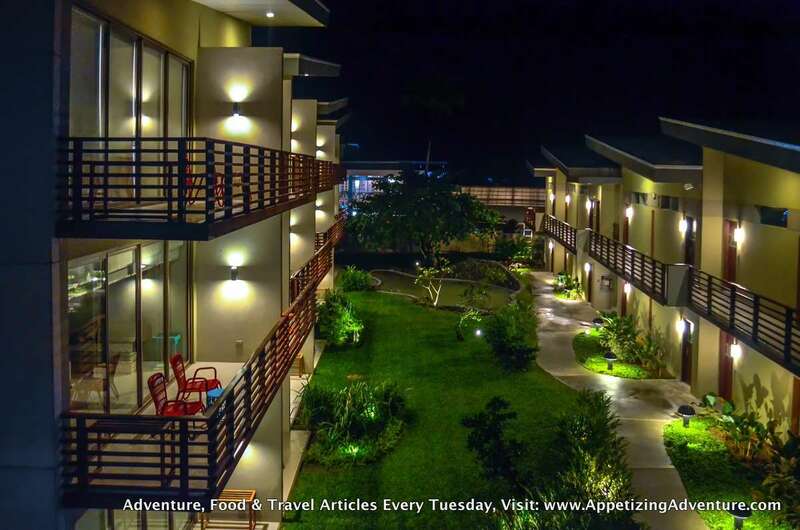 This is the best resort I’ve been to in Baler. Costa Pacifica is located right in front of Sabang Beach where surfing is a stone’s throw away. It has more than a hundred rooms to choose from. 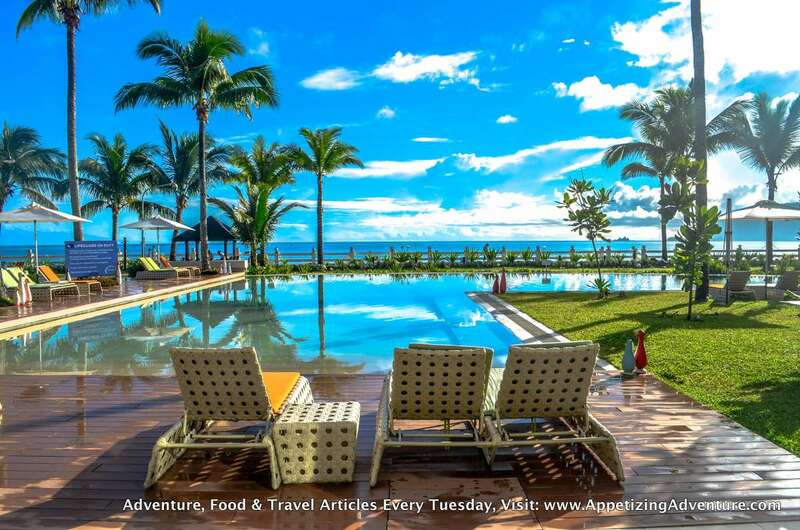 Ms. Charlotte Madarang of Aurora Provincial Tourism ranked Costa Pacifica as the number one resort in Baler. I couldn’t agree more and I have ten reasons to affirm this claim. 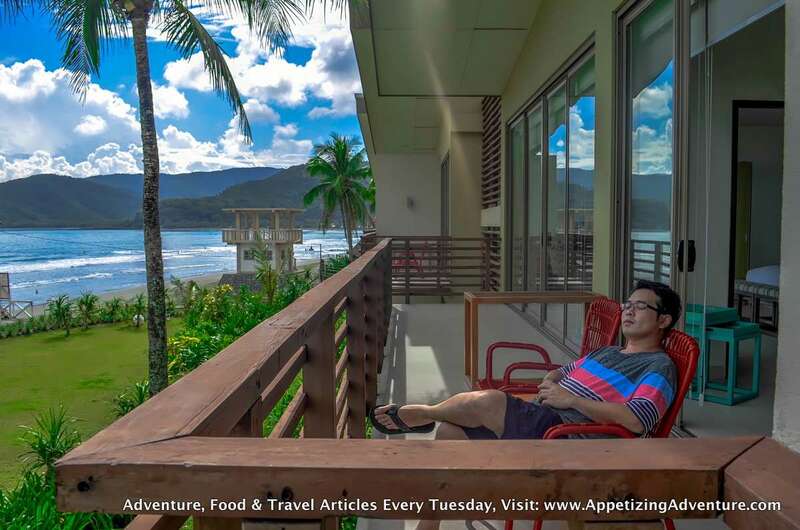 This is the only resort in Baler that welcomes its guests with a fresh buko-lychee juice and a cold towel. That’s pretty much what I needed after the six-hour drive from Manila. The drink is refreshing. The cold towel on my face brought back life to my otherwise heavy eyelids hoping to hit the sack. 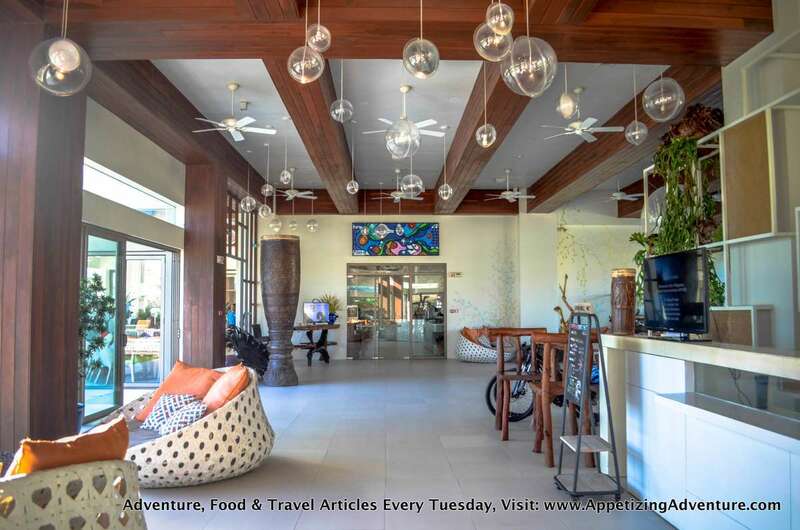 Costa Pacifica has the biggest and luxurious lobby in Baler. The high-ceiling lobby made me relish the big space. 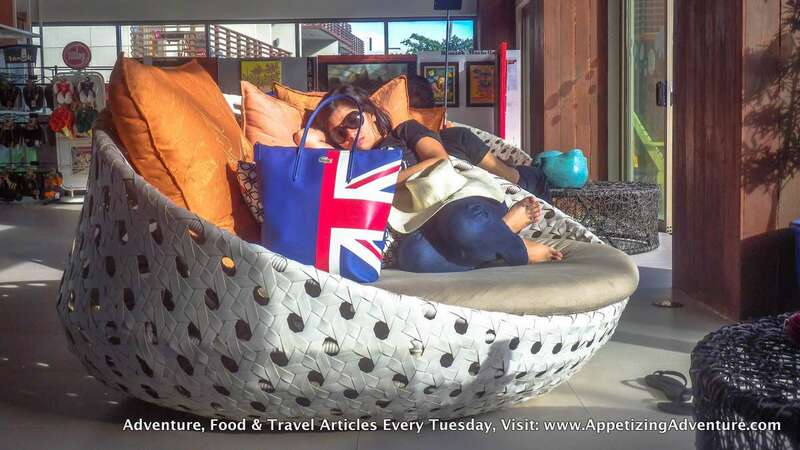 While waiting for the registration process to finish during check-in, choose from any of their giant chairs to sit in, or, even lie down and snooze. The area is wonderfully decorated giving both a rustic and a modern-minimalist feel. The centerpiece has earthy colors with wooden tables and chairs that seem to have been carved by nature and assembled by man. On top of the tables are plants, simple and relaxing to the eyes. The walls have colorful vines painted on them. The ceiling has globe lights, or lights inside what looked to me like huge see-through beach balls. The view is a masterpiece waiting for a click. This is my favorite spot in the resort to take photographs. 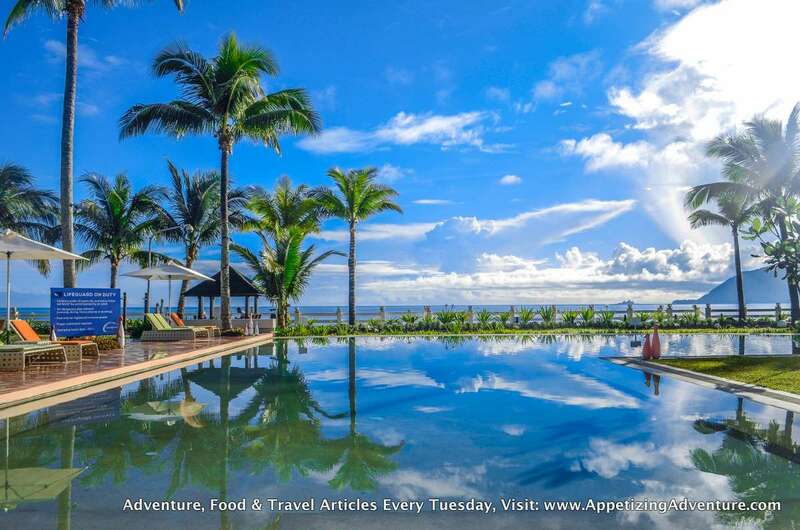 The L-shaped pool faces the Sabang Beach and mirrors the coconut trees and the sky. During the day, guests can enjoy free ice-cold lemon water and cucumber water beside the pool. With the long trip and packed activities for the day, the air-conditioned rooms in Costa Pacifica can help restore your strength by providing restful sleep in their cozy beds, soft comforters, and fluffy pillows. The rooms are complete with spacious cabinets, cable TV, complimentary bottled water, and occasional free sweet treats in the late afternoon. The toilets have bidet sprays or bum guns. This is something I prefer to have in resorts to feel clean and fresh when I do the number two. The bathrooms have complimentary toiletries and fresh towels to better enjoy the hot shower. However, most of their bathrooms inside the bedrooms don’t have doorknobs or locks. When you check in as a group in one room, better have an agreement so your friends know when you’re in the bathroom and they don’t accidentally enter. I’ve experienced two of their rooms, the Casa Loft and the Junior Premiere. 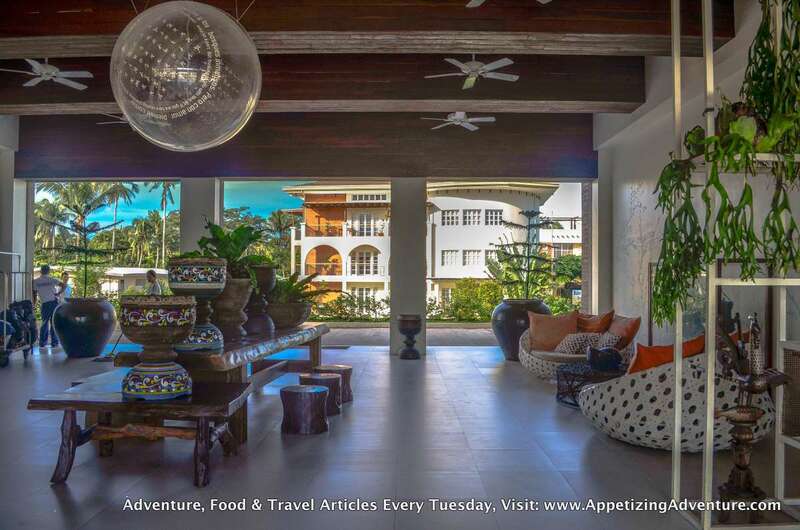 The Casa Loft Room is located in their annex building called Casa de Bahia, which is just across the main resort lobby. It’s a room with two floors. The first floor has a day bed, which is a sofa by day and converted into a bed by night. You can put all your stuff on the first floor, including all your worries and plans, so when you go up the second floor at night, it’s just peace and quiet. The main bed is on the second floor. The Junior Premiere Room in the main building has two types, one with two regular beds and a day bed, and the other with one big bed and a day bed. Be sure to request for the room you prefer depending on the number of persons in your group. We were four in our group when we stayed here, one person for the regular bed, two for the other regular bed, and one person for the day bed. The rooms in the main building have paintings of flowers and ferns on the white walls. It’s Costa’s signature look, consistent with the image they have at the lobby. 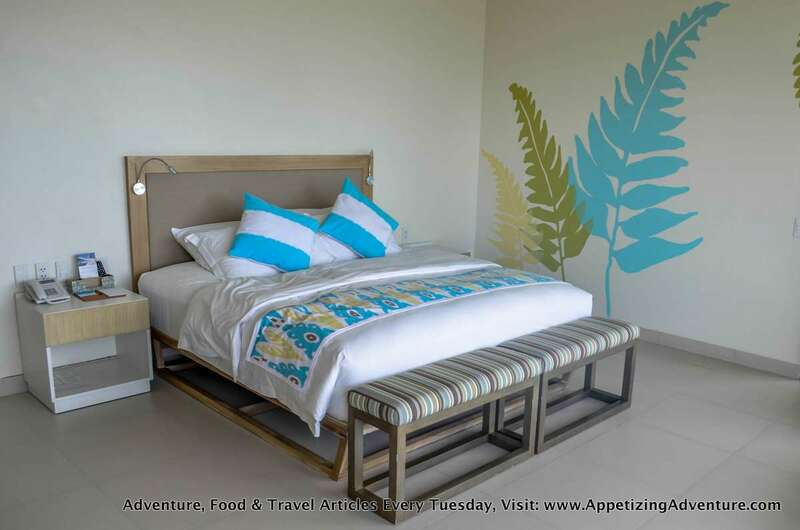 The also have special rooms with the amazing view of the Sabang Beach. I haven’t tried that yet because those rooms are always booked. But I’d love to imagine waking up to the warm colors of the cinematic sunrise being reflected by the sea. The check-in time is usually 2pm and checkout time is 12nn. If the room you’ve reserved is already vacant in the morning, you can request to go inside at no extra cost. I’m a breakfast person and I want it heavy! 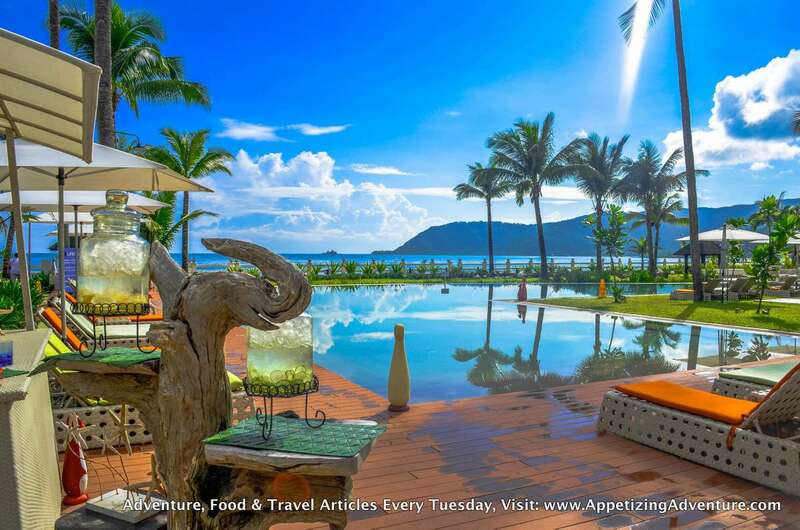 The Beach House is Costa Pacifica’s restaurant that does not disappoint. I had waffles loaded with cheese, chocolate syrup, and butter. You also have to try their thin crust cheese pizza cooked in their brick oven. I couldn’t get enough of their pizza. I think I had four slices. I had a generous serving of bacon too. I requested for the bacon to be toasted because I want to hear the crunch in every bite. Their bacon isn’t the regular salty kind, and that’s a good thing because, maybe that means, there’s less sodium. 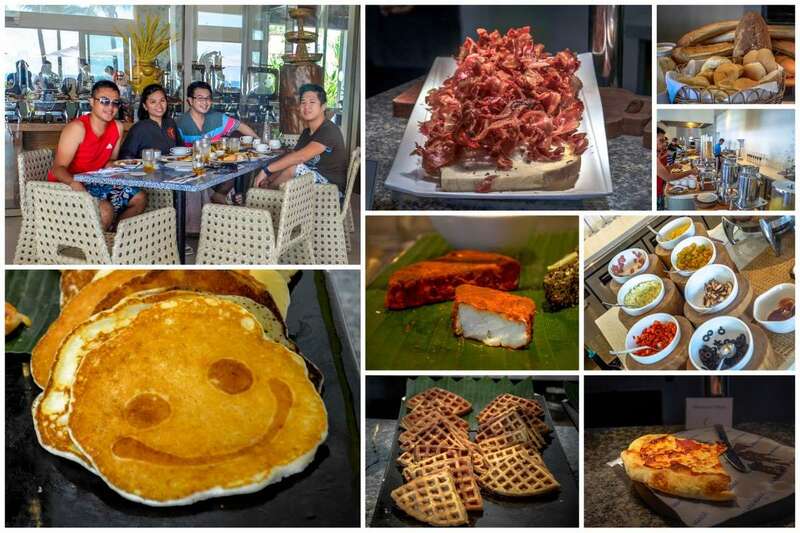 But that’s not all, they also have different food stations that include Filipino breakfast, eggs and omelets, cereals, fruits, bread, cheese, and congee. The breakfast, which is already included in their accommodation rate, is not always the buffet type. Sometimes they also serve a la carte. Better ask ahead when the buffet will be available. In case you don’t have time to go to the Pasalubong Center, the public market, or other specialty stores, Costa Pacifica has a decent Gift Shop beside the reception area. They sell footwear, accessories, Baler’s famous Nanay Pacing’s Peanut Butter, paintings made by Baler artists, and more. You just have to surf when you’re in Baler. You have to. I’m not athletic and I’m not a surfer, but Sabang Beach always, without fail, gives me the best surfing experience. Okay, it’s not like riding the waves or hanging ten kind of surfing, but just being able to stand on the surfboard for a few seconds, several times in a row is always a major fulfillment for me. Charlie Does is the resort’s partner strategically located near the main building offering surfing packages that include instructors and surfboard rental. It also has a souvenir shop and a beverage area where you can hangout. Not a clue on what to do in Baler? I mean except for surfing that is. The Primer Group is one of the resort’s Guest Services Associates that can help you customize your tour. If you like adventure, sightseeing, history, or, all of them combined, they can help provide a tour guide, van, driver, and other needs you might have. Other associates of the resort offer massage treatments, laundry, ATV rental, and kayak rental. Just inquire at the front desk. Even if I brought a car to Baler, one of the difficulties going around this town is parking space and getting right directions. The Free Shuttle Service solves all that. Guests are fetched from the airport or bus terminal and brought to the resort. You can also ask for assistance to be driven to the market, Pasalubong Center, restaurants, and other areas within Baler. One evening, my group availed of this free service and I was so relieved. It was raining then. I didn’t have to think about parking far from our destination and walking in the rain. The van brought us to the restaurant comfortably. 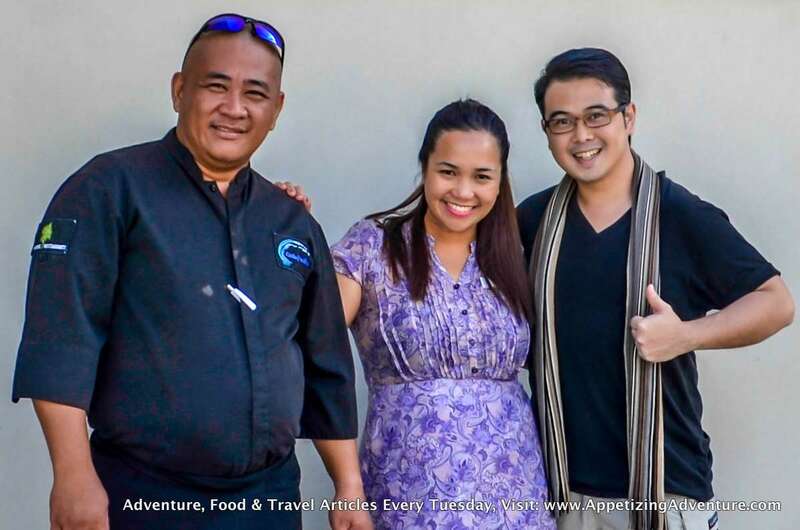 Trying out the different restaurants in Baler is also something I love to do. After my group had dinner, I called the resort’s front desk. I had to wait for about 20 minutes though because this service depends on the availability of the vehicles and a number of other guests requesting for the shuttle service. The resort has two types of vehicles, their air-conditioned van and their Pasajero (open tram). The Pasajero doesn’t have doors and it’s much like a tour vehicle making it easy for the passengers to take photos of the surroundings, and quickly hop in and hop off. During special occasions, the resort’s events venue, The Pavilion, is open to guests and other tourists for free live band performances. They also sell dishes and drinks matching the event’s theme. 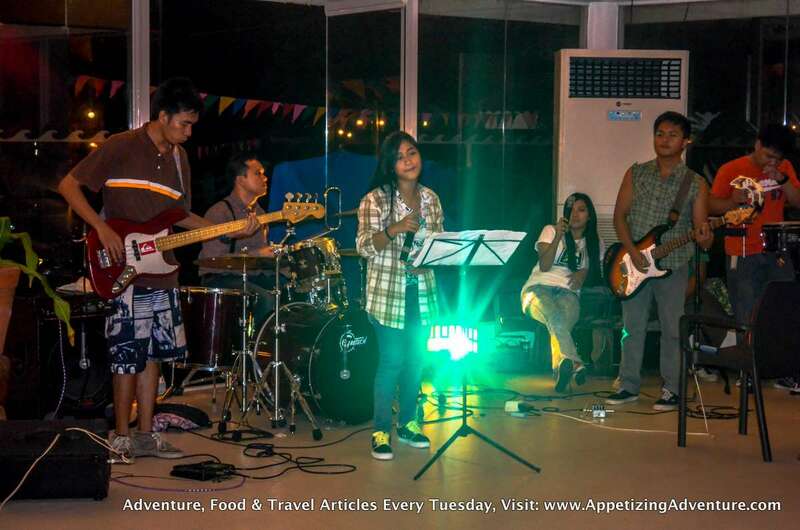 Last October 2014, my group enjoyed great live band music that played contemporary local and international songs. You can choose to stay in the air-conditioned area, or outside. Even if it drizzled then, I chose to stay outside because of the rustic ambiance. The Pavilion is closed on regular days but can be rented for special events like weddings, birthdays, conferences, and other celebrations. 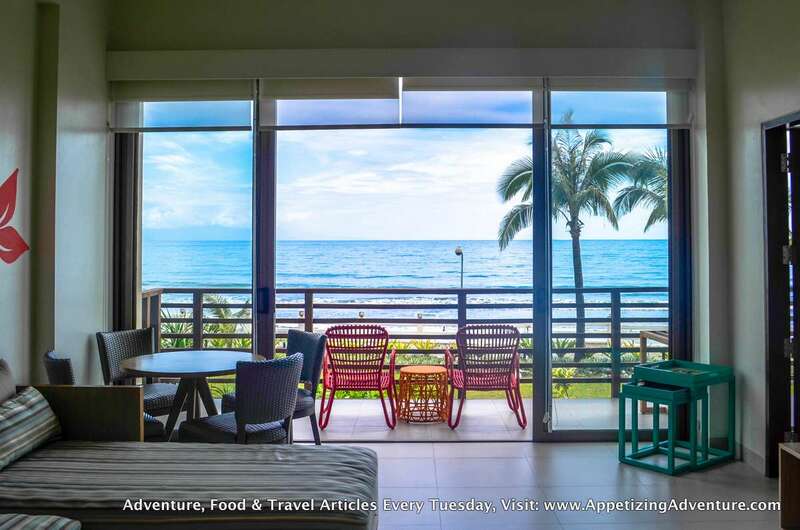 Click here to know what to order from Costa Pacifica’s restaurant, the Beach House. Click here for Costa Pacifica Rates.